The legalization of cannabis in Washington state allows adults to enjoy cannabis in many forms. It is legal to purchase, but now what? The legalization of cannabis in Washington state allows adults to enjoy cannabis in many forms: They can smoke dried cannabis flowers, inhale concentrated cannabis oil vapors, apply topical products (such as lotions or gels), or consume cannabis products in edible forms such as candies, baked goods, beverages and tinctures. If one is curious about experiencing cannabis, but is unsure where to begin, it helps to visit a retailer that merchandises its products with a focus on what type of experience the consumer seeks. This allows the customer to work closely with a knowledgeable store representative to aid in finding them the products that best fit their specific wants and needs. How can you consume cannabis? Aside from smoking and eating, how else can you experience cannabis? There are many cannabinoids in the plant, but the two that are discussed most often are THC and CBD. Many consumers have heard of THC, but are less familiar with CBD. THC, or tetrahydrocannabinol, is psychoactive and will get a person “high” or “stoned.” CBD, or cannabidiol, has no psychoactive effects. Both may be used in medicinal circumstances. The effects of cannabis also depend on the mix of terpenes, or essential oils, that occur naturally in each cannabis plant. Terpenes affect not only the flavor profiles and scent notes, but also play a role in influencing the effects of the plant. What are the major strains of cannabis? Theorem Cannabis distinguishes between indica, sativa, or hybrid strains of the plant. Indica plants generally have relaxing effects, while sativa plants are more stimulating. Hybrid plants have been bred to mix the desired effects from both indica and sativa strains to create a wider range of experience options. What do cannabis products cost? Purchasing cannabis is not much different than the per serving or per dose price of other legal substances. Purchasing cannabis-based products is a varied game as stores have different pricing strategies. At Vela and Theorem a prerolled joint that will provide multiple experiences costs from $5 to $15. In the edibles department at Vela, Willie Nelson’s “Willie’s Reserve”-brand candies might cost $9 for four servings (with 5 mg of THC apiece). Capsules break down to about $4-$5 dollars apiece, and topicals (a little goes a long way) start under $25. These shops are cash only, so be sure to bring cash or have a debit card handy to use at their on-site ATMs. Theorem Cannabis is located at the north tip of Lake Washington. They are setting the standard for providing a well-rounded cannabis experience. 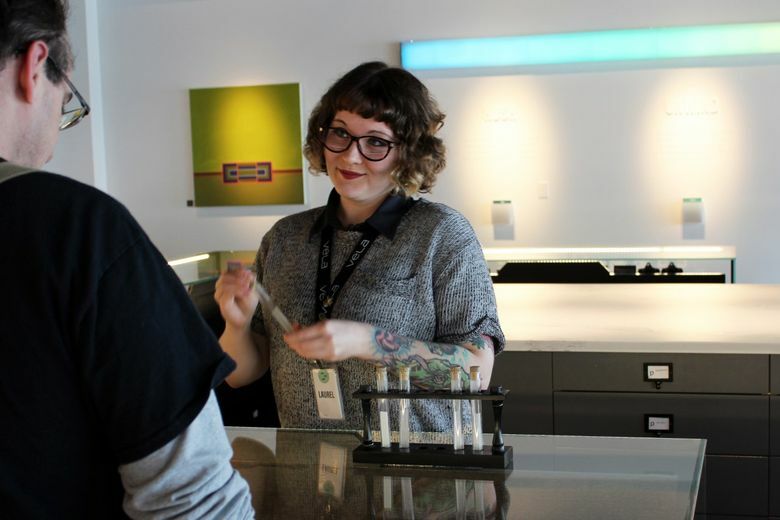 Vela Cannabis, in Seattle’s SoDo neighborhood, offers a unique shopping as well as educational experience, with viewing windows into an indoor cannabis garden and processing lab.